Zion Market Research has published a new report titled “mHealth Solutions Market by Services and Products (Connected Medical Devices (Consumer Health Devices and Clinical Devices), mHealth Apps (Healthcare Apps and Medical Apps), and mHealth Services): Global Industry Perspective, Comprehensive Analysis, and Forecast, 2017—2024”. According to the report, the global mHealth solutions market was valued at approximately USD 21.3 billion in 2017 and is expected to generate around USD 160.5 billion by 2024, at a CAGR of around 33.48% between 2018 and 2024.
mHealth is the provision of healthcare and related services through mobile communication devices. The mHealth solutions use smartphones, tablets, and wearable devices for health services and data collection. Mobile devices act excellent sources to improve health outcomes and offer innovative health services to any part of the world via information and communication technologies. The worldwide prevalence of life-threatening diseases is increasing due to changing lifestyle habits, sedentary lifestyle, and lack of exercise. The growing health awareness among patients is likely to boost the mHealth solutions market in the future. Additionally, the increased use of tablets, smartphones, etc. is increasing among all age groups and the penetration of third and fourth generation networks helps in providing uninterrupted health services. Healthcare professionals are focused on offering patient-centric healthcare services. The mHealth apps help maintain patient records, allow remote monitoring, consultation, and prevention and treatment services. Thus, these aforementioned factors are likely to drive the mHealth solutions market in the upcoming years. However, the lack of regulations, standards, and reimbursement policies might hamper the mHealth solutions market growth in the future. The global mHealth solutions market is segmented based on products and services and region. By products and services, the market is segmented into mHealth applications (apps), connected medical devices, and mHealth services. Connected medical devices segment is further segmented into clinical devices and devices for consumer health. The clinical devices segment is further classified into vital signs monitoring devices and fetal monitoring devices, peak flow meters, multi-parameter trackers, sleep apnea monitors, neurological monitoring devices, and other connected medical devices. Vital signs monitoring devices is sub-segmented into blood glucose monitors, blood pressure monitors, ECG monitors/heart rate monitors, and pulse oximeters. Other clinical devices segment includes coagulation monitors, thermometers, fetal maternity monitors, and digital skin sensors. The mHealth applications segment is divided into healthcare applications and medical applications. Healthcare applications segment is divided into chronic care management apps, general health and fitness applications, medication management apps, personal health record (PHR) apps, women’s health apps, and other healthcare apps (dermatological treatment, sleep monitoring, and emergency response (vital tracking)). General health and fitness Apps are classified into weight and obesity management apps, health-tracking apps, and fitness and nutrition apps. Chronic care management apps are classified into diabetes management apps, behavioral disorder and mental health management apps, cancer therapy management apps, blood pressure, and ECG monitoring apps, and other chronic care management apps (kidney disorders and respiratory diseases and infections management apps). Women’s Health Apps are classified into fertility apps, breastfeeding apps, pregnancy apps, and other women health apps (apps for sleep, activity, and stress level tracking). Medical apps are made for medical professionals and are classified into continuing medical education apps, consulting and communication apps, medical reference apps, and patient management and monitoring apps. The mHealth services segment includes diagnosis and consultation services, remote monitoring, healthcare system strengthening services, treatment services, prevention services, and fitness and wellness services. The presence of advanced healthcare systems increased usage of smartphone and other devices penetration, the higher adoption rate of innovative technologies are some of the key factors that are likely to boost the North American mHealth solutions market in the future. North America held a major share, i.e., around 45%, of the global mHealth solutions market in 2017. At the country level, the U.S. is the major market for mHealth solutions in the North American region and at the global level. Europe held the second leading position in global mHealth solutions market in 2017. The Asia Pacific region is estimated to register substantial growth in the mHealth solutions market in the estimated period, owing to the presence of a large number of pharmaceutical companies. 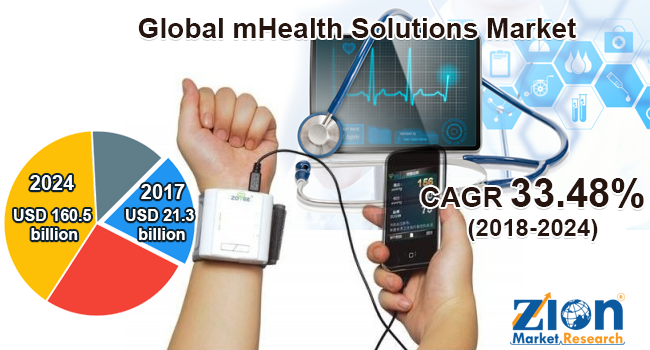 Some key players of the global mHealth solutions market include Medtronic Plc, Koninklijke Philips N.V., Omron Corporation, Apple, Inc., AirStrip Technologies, AliveCor, Inc., LifeWatch AG, Withings, BioTelemetry Inc., Athenahealth, Inc., AgaMatrix, Inc., iHealth Lab, Inc., AT&T, Cerner Corporation, Cisco Systems, Inc., and Nokia Corporation, among others.